Erases clean with rubbing alcohol! Unlike normal sticker paper the ink won't smudge or stain your hands or clothes. They won’t run or peal off in ice water and are dishwasher and star-san safe. Reuse your labeled bottle over and over. Writable and erasable with our Garage Monk dry-erase marker. Ink washes clean off with common rubbing alcohol (92% works best). Just peal, stick and make more beer. Generics are sold on both retailer sites Amazon & Etsy and at a few local homebrew shops. 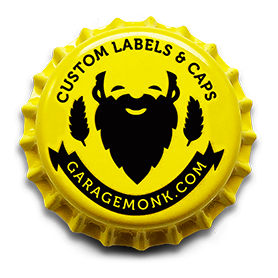 My custom personalized labels, aprons and bottle caps are sold exclusively on Etsy. Made in the USA. Not China. HOW TO ORDER CUSTOM DESIGNS? You need to place your order on my ETSY shop. Choose a design and tell me your words, color or image in replace what’s on the original. I’ll do the dirty work for you. (Or send me your own design.) I can print photos too! I’ll send you a frame-worthy personalized proof ASAP. Once you approve your order, I’ll print and ship. Voila! The best home brewers gifts ever! It took me months of trial and sourcing to make these work. I homebrew so I’ve learned the hard way. These save time and money. My products are all digitally printed on water-proof vinyl sticker material, hand cut, packed and shipped from my rathskeller here in Dana Point. Tears of joy and satisfaction are guaranteed. SHOP MY CAPS, APRONS & LABELS ON ETSY! SHOP MY GENERIC LABELS ON AMAZON! Watch the vid below to find the ETSY discount code!